One of the initiatives funded through our 2016 Kickstarter campaign was the release of FIVE new multi-artist compilation albums in 2017. The latest offering from Under The Radar is a collection of 12 high-quality live performances from the first four years of the Escape To The Lake gathering (2013-2016). 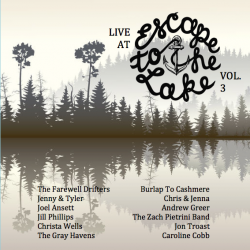 This release is titled Live At Escape To The Lake, Volume 3 and it's available for FREE on NoiseTrade. If you feel led to give a "thank you" tip, 100% of the tip jar will go to support the non-profit ministry work of UTR!